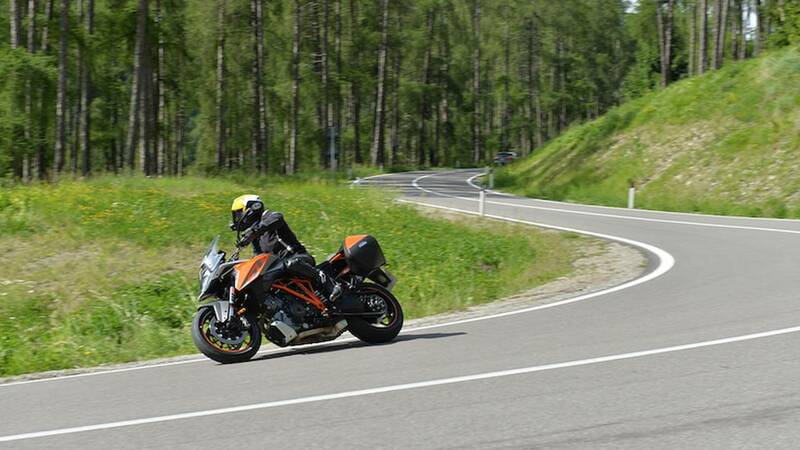 A screaming tour through the Alps convinces us of the brilliance of KTM's wünder-sport tourer. KTM's Super Duke hit us all like a smack in the face when it burst onto the scene more than a decade ago. It was loud, in your face, and couldn't possibly care less what you thought about it. The 990cc V-twin engine was about as polite as a drunk being thrown out of a pub, and every other quality in a bike that you might consider desirable was cast aside like an unwanted stepchild. Fuel economy? Who cares. Comfort? Not interested. 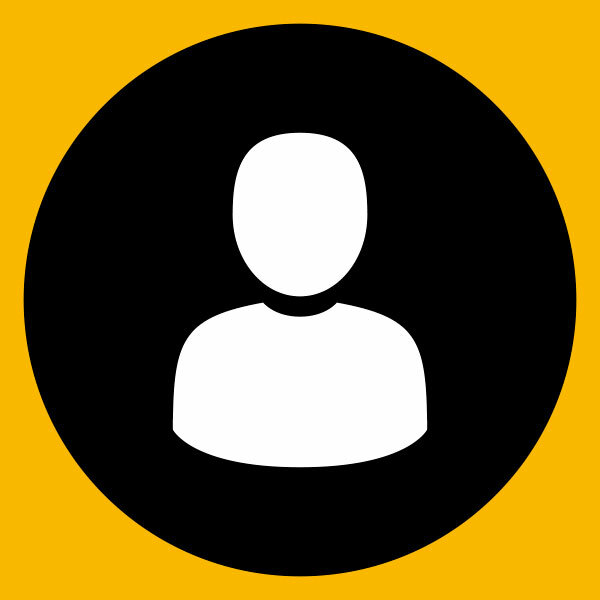 Refinement? Never heard of it. We'd all probably agree that the world's a very strange place at the moment, not least because there's a Super Duke wearing a badge that has the letters "GT" on it. GT usually means fast, sophisticated, refined—all of those types of words. 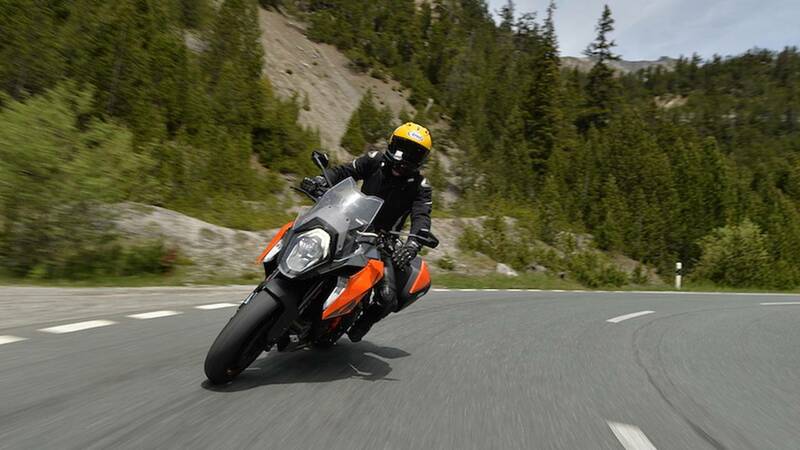 KTM's 1290 Super Duke wouldn't ordinarily be the first bike to spring to mind. But here it is, the Super Duke GT, in all of its orange-and-silver-clad glory. First introduced at EICMA back in 2015 you'll be thoroughly unsurprised to hear the GT finds its roots in KTM's 1290 Super Duke R—a bike the Austrian company nicknamed "The Beast." The 1290 Super Duke GT has most of the same core componentry. There's no difference in the chassis; the head angle is identical, as is the suspension travel front and rear, and likewise so are the ground clearance, wheelbase, and seat height (which is 835mm or 33 inches). Dry weight, however, is upped by 10 kg (22 lbs), and that's down to a beefier sub-frame for luggage and pillion-carrying ability, as well as a much larger tank (23 liters or 6 US gal vs 18L/4.75 US gal approximately). A more substantial fairing setup (although it's still very much a naked bike) also adds a little weight. It's still a fairly light bike, though, at 205 kg (450 lbs) dry. Unlike the chassis, the monstrously powerful engine does see some slight tweaking. Peak horsepower is reduced a tad from 177 to 173, which is made in full at 9500 rpm. The torque curve has been brought forward marginally allowing the GT to make peak torque 250 rpm sooner than the R, at 6750 rpm. You're able to choose a throttle/engine map to suit the task at hand: Sport for spirited riding, Street for most normal situations, and Rain for, you guessed it, rain. Rain is the only mode where power is restricted (~100 hp), whereas in Sport or Street, you're given full power. Disappointingly, unlike the 1290 Super Adventure S and 1290 Super Duke R, the quick shifter only works up the 'box rather than down as well. Brakes and suspension are identical to the R. The gigantic Brembo M50 calipers grace dual 320mm front discs, and the rear brake is a Brembo twin caliper unit which squeezes a 240mm disc. The front and rear brakes are linked, meaning the rear brake is automatically applied when the front brake is operated. The rear brake lever operates only the rear brake, and this feature can be disabled if so desired. The GT's suspension is by WP, and it's the same semi-active suspension as on the R and Super Adventure S. There's various damping modes to select from - Sport, Street and Comfort - as well as the ability to adjust the rear shock's preload on the fly by telling the bike if you're carrying a passenger (or not) and luggage (or not), making for four pre-load settings in total. As with the R, there's a non-adjustable WP steering damper tucked away near the yokes. Electronics are made by Bosch and serve as the brains behind the ABS and traction control systems. 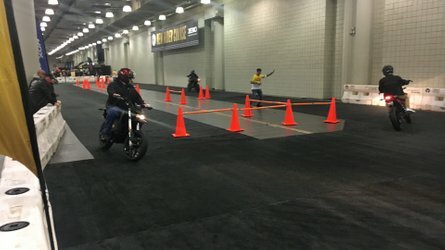 Both systems are sensitive to lean angle via a six-axis IMU (inertial measurement unit), which is also used to light up a three-tiered bank of LEDs either side of the bike. The further you lean, the more tiers light up, forming a cornering headlight system. 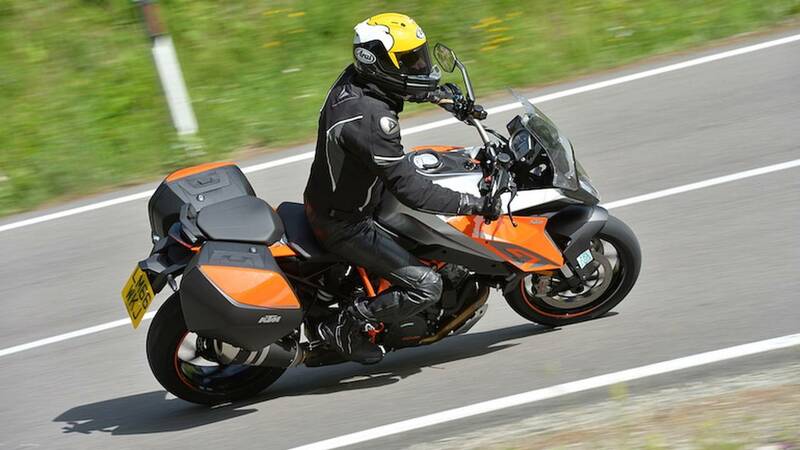 Like any decent sports tourer, the 1290 Super Duke GT has an integrated luggage system. Pannier mounts are discretely built into the sides; there are no rails, brackets or other mounting points in sight. Unfortunately, there isn't a linked push-rod system to enable the panniers to move in sync – as found on the Super Adventure range – but the panniers are rated to 105 mph – quite a bit more than your typical Givi set-up. A top box can also be fitted via an extension plate, and there's an expandable tank-bag system available to be mounted to the fuel filler cap. The conspicuously larger tank provides a decent amount of wind and rain protection for a naked bike, and the bigger headlight unit, plastic fairing, and adjustable screen add to that. There's not much protection for your hands, though. 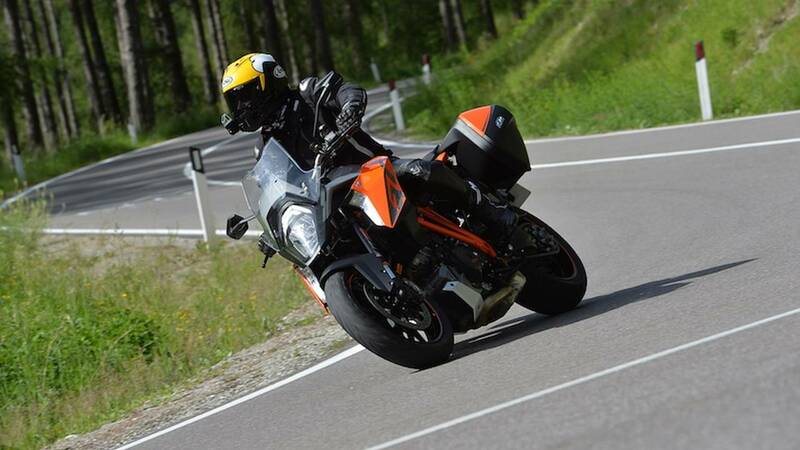 Since most of the differences between the R and GT are ergonomic or practical, in theory the GT is a slightly more usable, easier-to-live-with R. To put this theory to the test, RideApart gladly accepted an invitation from KTM UK to ride a 1290 Super Duke GT in the Austrian, Italian, and Swiss alps. KTM also asked us if we'd consider riding the GT all the way back to the United Kingdom via France. "Oh hell yes," we said, half wondering if it was a trick question. Awaiting us outside KTM's Mattighofen, Austria-based factory stood a just-run-in GT equipped with a set of panniers, a tank bag, and a roll bag to strap across the back of the bike. 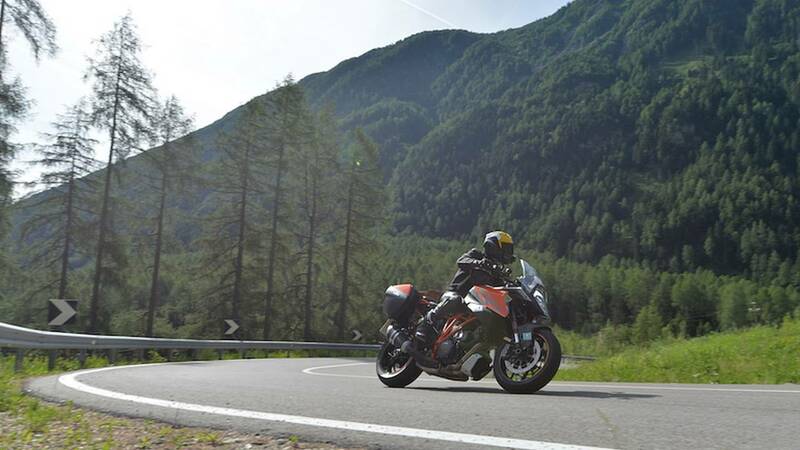 Unlike most press rides – which typically involve a lead rider controlling the pace on a pre-determined route – we were handed the keys and simply told to ride to a rendezvous point at Lake Reschen, roughly 200 miles away – just over the border between Italy and Switzerland. In other words, it was a complete free for all, no constraints, no adult supervision, nada. "Go and enjoy yourselves," they said. 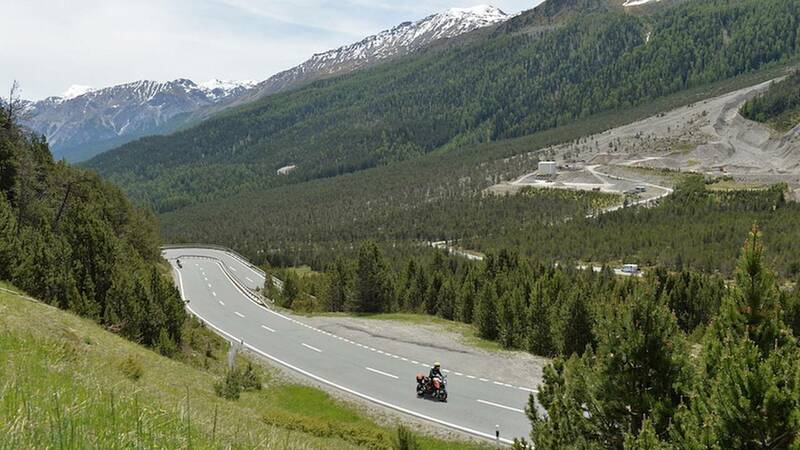 With the help of local knowledge from Peter Schonlaub, editor of Austria's Motorrad Magazin, we picked a route we thought would play to the GT's strengths. We opted to take in as much Alpine scenery and as many types of twisty road as possible. The route clipped through the southernmost point of Bavaria, then straddled the foothills of the Austria-Germany border before skirting the top of Innsbruck and finally dropping down into Austria proper – in the direction of Reschensee, Italy. And what a route it was. Having never ridden in the Alps before it was a complete eye opener and I'm still not entirely sure I have the vocabulary to do the geography, views, and scenery justice. If you've not ridden in the Alps, just go. A few days of kit were thrown into the panniers - each large enough to accommodate a full face helmet - and the rest was shoved into the tank and roll bags. The ignition turns on via a standard key arrangement, not the keyless ignition system as found on the Super Adventure S. As soon as the clocks had done their sweep, in true internet-generation-style I dialled a few settings in. Engine into Sport mode, suspension ditto, with preload set to one rider with luggage, and ABS set to Road mode. All the other electronic aids enabled: traction control and motor slip regulation, a fancy optional feature that alters the throttle butterflies under hard deceleration – when the electronics suspect the rear wheel is about to lock up. A quick check of the tyre pressure monitoring system, thumb the starter, and the engine barked into life. Damn, that's loud. It's 1299 Panigale levels of loud, and this is Euro4 compliant! A tiny amount of town work before getting out into proper countryside revealed two features I'd forgotten: auto cancelling indicators and hill hold control. They work well, but it'll take you forever and a day for your muscle memory to stop hitting the indicator cancel button periodically. Twist the throttle and the GT morphs into a completely different animal. Below 4000 rpm the engine simply feels like the gruntiest, strongest engine you've ever ridden. Slow corners can be taken in 3rd gear with ease, and once you're out of the other side you just wind the power on and disappear into the distance. Above 5000 rpm, though, the engine takes on an entirely different character. 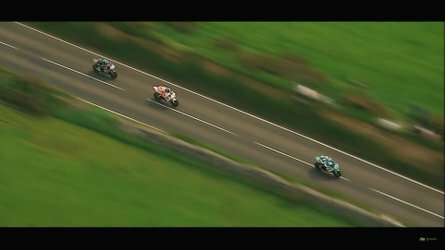 It explodes into a fit of rage and revs up like no V-twin has any real right to, with a soundtrack to match. You really get the impression the internals must be very light (and they are) to enable this engine to feel so free-revving. Low down in the rev range it's a bit clattery - you won't be able to ride around in town at 30 mph in 5th or 6th – but it's no bother because on the opposite end of the spectrum, it'll do 70 mph at 4000 rpm in top, and 100 MPH at 4750 rpm. The GT handles amazingly. As you'd expect, these roads threw all sorts of fantastic corners at us for most of the 200-mile journey to Reschen. With the suspension in Sport mode we were free to attack corners at any pace. Unlike the 990cc Super Duke of old, the fuelling is free of on-off jerkiness common to ride-by-wire systems. The wide bars make the bike easy to hustle through hairpin corners and sweepers alike, and the footpeg position is a decent compromise between sporty and comfy. The suspension offers plenty of feedback and generally the bike will go wherever you point it without protest. The faster you go, the better the GT seems to get. Unfortunately, we had to hit a bit of motorway near Innsbruck but that gave opportunity to sample cruise control, as well as Comfort mode, and play with all the features. Cruise control is a godsend and works well. 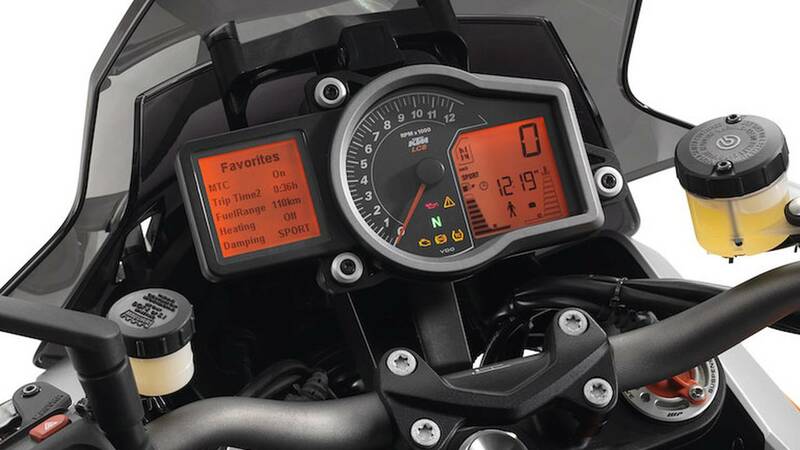 Speed can be adjusted in 1-mph increments via an up-down button on the right handlebar, with a master on-off switch. It works between 25 and 125 mph in 4th gear or above. The windscreen provides fairly decent wind protection, but I should note I'm not very tall: 5 feet 9 inches. Taller riders may fare less well. The screen itself can be adjusted vertically on the fly, but in excess of 70 mph wind pressure makes it very difficult to adjust. 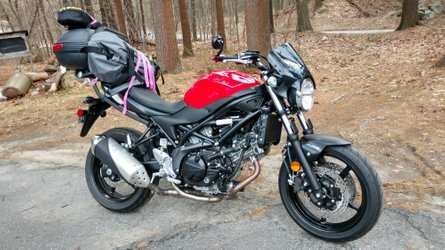 The 1,000+ miles covered on this adventure provided plenty of time to really get to know the bike (I had it for a fortnight after the trip, as well), and like any other bike, it's not without flaws. The biggest one is the mirrors. When riding above exactly – and I mean exactly – 48 mph, wind buffeting renders them borderline useless. Reflections turn into blurry diagonal lines; it's so bad you'll prefer to look over your shoulder than trust them. Such a simple thing to get right, so nul points to the team from Austria here. Especially since mirrors work just fine on other KTMs. I suspect air turbulence created by the tank is to blame. Next complaint is the placement of the cruise control buttons. They're on the right handlebar. Why? A number of other manufacturers do this, but that's no excuse. To activate cruise control, you either need to have gigantic hands, or let go of the throttle to reach the buttons, or reach across with your left hand. It's awkward and arguably a bit dangerous. Case in point, at a rather high speed at night on a French motorway, I reached over with my left hand and accidentally hit the kill switch while fumbling around trying to find the button. 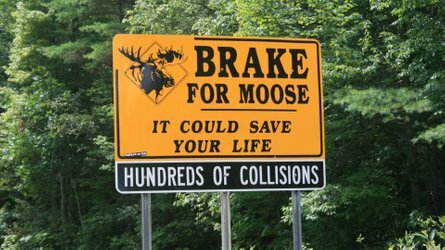 My own fault, sure, but seriously, it just shouldn't come to that; put the controls on the left. My third gripe is that the panniers don't quite close properly, which triggers my OCD side. It doesn't look right and leaves you wondering whether water's going to make its way in or if they'll burst open and barf their contents all over the road. Related to this, the mounting mechanism for the KTM tank bag is fiddly and offers next to no reassurance of its being secured properly. Plus, you have to go through this rigmarole each and every time you require access to the fuel cap. It's a proper chore, and a system which KTM have gotten right in the past. On my own KTM 950 SM the setup is zero fuss, operable with gloves, and 100-percent reliable both physically and visually. Why change what isn't broken? Other than that, you have to descend into real nit picking to find anything to moan about: slight vibration numbness in my right hand after smashing out 800 miles in one day across France. And... uhm... the exhaust valve servo could be hidden under the seat (there's room, I promise) to tidy the rear of the bike. There's so much about the GT that's premium. 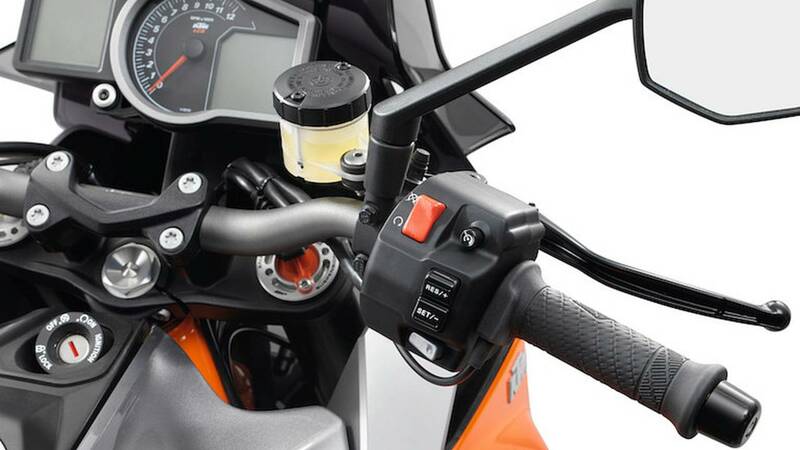 Heated grips come as standard, for example. Gear and brake lever peg positions are adjustable. Fit and finish is superb; anything painted is painted with proper, thick, decent paint. Buttons feel solid, plastics are good quality, cables are routed tidily, and so on. The toolkit under the seat is comprehensive and high-quality, and even has a bottle opener in there. There's a 12v socket on the side of the dash, and an an accessory integrated mount above the dash is available for GPS devices and phones and such. Over the aforementioned 800-mile journey across France, I averaged 42 mpg, which I thought very reasonable given the size of the engine and the fact I didn't shy away from using as much throttle as possible. And that leaves us only to talk about what else is in the 1290 Super Duke GT's peer group. The obvious candidate is BMW's S1000XR, or perhaps Yamaha's MT-10 SP Touring. Beyond that, it's hard to name any other true alternatives. Either they're nowhere near the price or spec level, or stray into adventure bike territory. Ducati's Multistrada 1200S won't get anywhere near in the handling department. 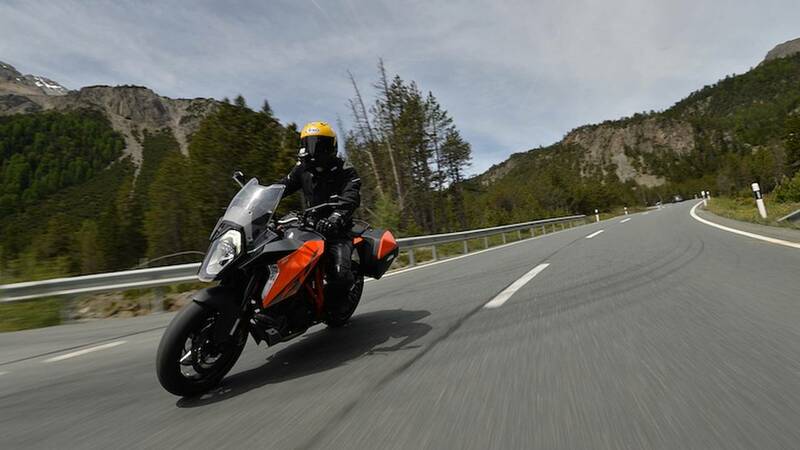 Same goes for KTM's own Super Adventure S. Meanwhile, Honda's VFR1200F falls short of the mark on spec and handling. Triumph's 1050 Sprint GT doesn't even get a look-in, albeit a fantastic bike in its own right. The GT is a classy, super-premium bike that will excel at anything you could possibly ask it to do on tarmac, especially if you like going fast. An asking price of £15,999 (or $19,999 in the United States) before any extras is steep, but you get exactly what you pay for. It'll make mincemeat of entire continents, eat twisty roads for breakfast, and in the right hands it will embarrass superbikes at a track day. It'll turn a dull commute into the highlight of your day. Passenger work will be shrugged off. It's got almost every feature known to man. 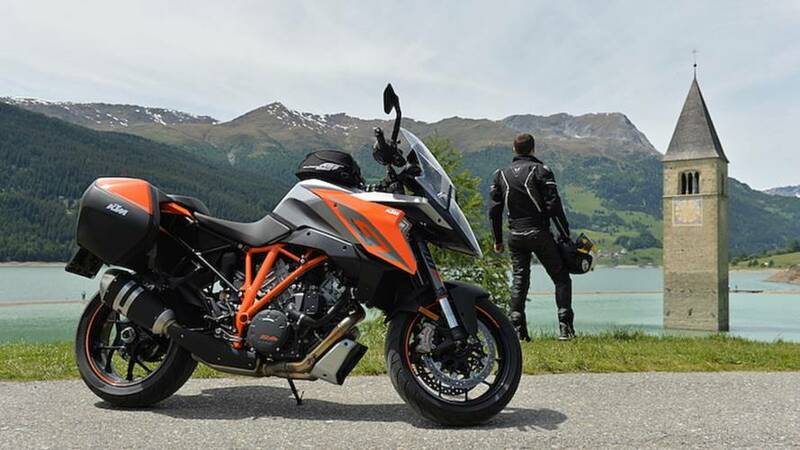 If you're in the market for a do-it-all motorcycle but don't need or want an adventure bike, you'd be a fool not to consider the 1290 Super Duke GT.